Is your horse getting duller to your cues? Do you make a request only to have him shoot you a condescending glance and go back to what he was doing? It might be that you're not asking so much as badgering - and so much so that the horse has decided to write you off. When we want a horse to stay sharp, we need to ask, then apply motivation if he doesn't immediately try. He doesn't have to get the correct answer right away, mind you - he only has to try. (Punishing when he tries is another way to take the edge off your performance - after all - what sort of motivation does that make?) Look at it this way: When you ask your dog to sit, do you say "sit, sit, sit"? Nope. When you get on your horse, and pick up a trot, do you say "trot,trot, trot" or do you say "trot" and expect him to hold that gait? Why, the latter, of course. The same logic should hold true for all of our training, as I'll explain. 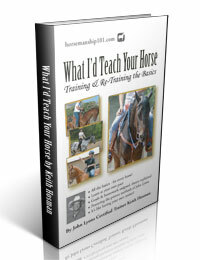 Is your horse getting duller to your cues? You can keep your horse sharp and improving when you keep your cues straight as outlined here. When you ask for the horse to backup, and he slows down as he backs, are you guilty of pulling harder on the reins to act as motivator? Well, hey, don't do that. The reins tell the direction you'd like to go, your legs tell the speed. Pulling harder on the reins causes him to resist throughout his entire body. And, when his skeletal structure is all lined up like this, he can rely on his bones for support in pushing back on you - and he's gonna win. Instead, use your legs to get him motivated. Alternatively, try loping him out forward for a moment to put some fire in his belly and then ask again. When you spin your reining horse and he drags through the motion, are you guilty of pulling his head around for more speed? Well, don't do that. You're throwing the horse completely out of any natural posture he might need to complete the spin and you're breaking the rule that states "Reins signal the direction, legs signal the speed." The reins are your steering wheel, your legs are the gas pedal. If you wanted your car to move faster through a turn, you'd apply more gas. Get it: eBook, paperback & even audio!